Shooting saw some big improvements in FIFA 12, when compared with FIFA 11. In FIFA 12, you can expect to score from many different angles and distances, whereas you probably couldn't say the same about FIFA 11. Shots are generally much harder than they have been in previous versions of FIFA, so you can expect to score from a variety of ranges, provided you're using a player who has decent shooting attributes, especially power. Most people overlook it, but it's worth knowing who has good shooting stats and who doesn't so you know when you should be shooting. The regular, laces shot is best for long range shooting, but it is also quite effective from closer ranges as well. You perform the regular shot with your console's default shooting button alone. An important tip is that you should pay attention to your set-up touch before shooting. By this I mean that you can't expect to rip one with a small touch, you need to set yourself up with a touch in front of your player so he can get some power into it. Regular shots can also be volleys and headers, so the controls are no different. Finesse shots are sidefooted strikes which are particularly useful when shooting from in and around the penalty box. Finesse shots are generally more accurate than regular shots, but will be much less powerful. They are useful for picking out corners, but don't expect them to be as useful as they were in FIFA 11. 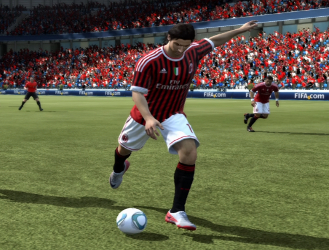 In FIFA 12, they're still highly effective from tight angles, but it's not as ridiculous as in FIFA 11. Finesse shots also have a decent bit of curve, the amount depending on the strength of shot and time it has to curve. To execute a finesse shot on Xbox 360, hold down RB while shooting, and R1 while shooting on PS3. 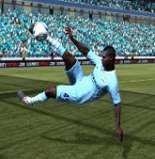 Unlike FIFA 11, in FIFA 12, you have the ability to control the occurrence of acrobatic shots such as bicycle kicks or diving headers. To do so, you obviously need to be set up correctly, including having the ball in the air. For Xbox, hold down LT as you shoot, and L2 for Playstation. For lower shots, such as double-tap or triple-tap low crosses, you can do the same thing and pull off some cheeky little flicks and backheels. It's really quite simple, but it's more about the timing and set up than anything, but you can pull off some really spectacular goals if you do this well. Chip shots are useful shots which are used to cheekily loop the ball over the goalkeeper and into the goal. A chip shot has a high arc and is not very powerful, but is useful for when the goalkeeper is not on his line and a bit farther away from the goal than he should be. This scenario occurs a lot when a player is on a breakaway and the opponent rushes his goalkeeper out too early, giving you enough time to chip it over him before he gets too close to cut off your angle. Sometimes in FIFA 12, goalkeepers are off their line for no good reason, so you should look for this and give it a try if he is. On Xbox 360, chip shots are executed by holding down LB as you are pressing the shoot button, and likewise for PS3 although you want to hold down the L1 button instead. By default, FIFA 12 is set to assisted shooting. This means that whenever you take a shot, the computer ultimately directs the shot and determines its power for you in relation to where you “sorta” directed the shot and how long you held the stick for. Once you set your shooting settings to manual, you will realize just how much the computer helps you get your shots on target. When you first set manual settings, don't be discouraged by how your shots go everywhere but into the net. You will improve over time and in the end it will be worth it as your shots will be determined 100% by your command. This means that once you get good, you can hit the far corners out of the keepers reach much more frequently than if you'd spent the same amount of time practicing shooting with assisted settings.